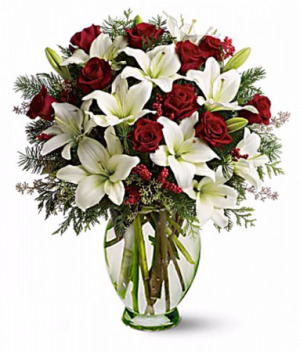 White Asiatic Lilies, Red Roses, Douglas Fir, Seeded Eucalyptus And Small Red Berries Are Gathered Into A Glass Vase To Create A Versatile, Natural Piece Of Holiday Dcor, Orientation: Onesided. 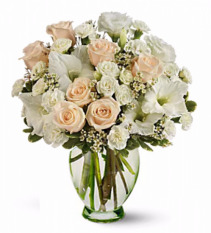 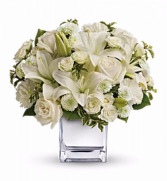 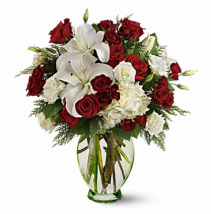 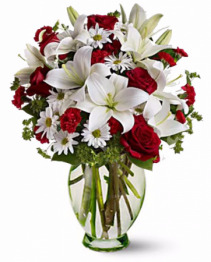 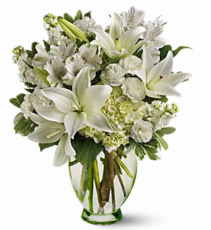 The Lovely Bouquet Includes White Hydrangea, Red Roses, White Oriental Lilies And White Lisianthus Accented With Flat Cedar, Orientation: Onesided. 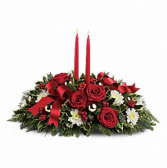 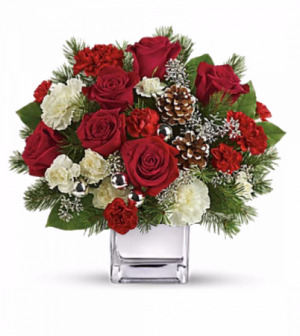 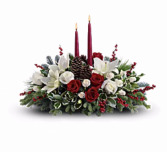 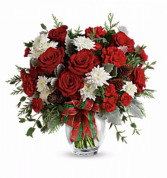 Beautiful Red Roses, White Alstroemeria, Miniature Red Carnations And White Cushion Chrysanthemums Are Arranged With Variegated Holly, Flat Cedar, Silver Lemon Leaf And Frosted Pinecones, Orientation: Onesided. 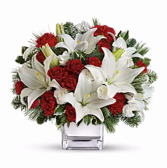 This Bold Bouquet Includes Red Carnations, Red Miniature Carnations, White Cushion Spray Chrysanthemums, Flat Cedar, Noble Fir, Dusty Miller, Parvifolia Eucalyptus, Small Pinecones And Wired Ribbon, Delivered In Redlands Bouquet Florist Glass Ginger Jar, Orientation: Onesided. White Roses And Red And White Carnations Are Mixed With Delicate White Million Star Gypsophila, Holly Branches And White Pine, Orientation: Onesided. 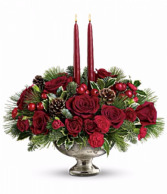 Two Deep Red Taper Candles Are Secured In A Bed Of Noble Fir, White Pine, Variegated Holly, Red Roses And Red Carnations Pinecones And Berries Add More Seasonal Color, Orientation: Allaround. This Stunning Centerpiece Features Red Roses, White Cushion Spray Chrysanthemums, Variegated Holly, Noble Fir, Flat Cedar, White Pine, Red Berries, Gold Ornament Balls, Red Ribbon, And Red Taper Candles, Orientation: Allaround. 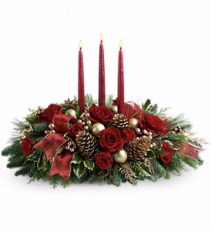 Miniature Carnations Are Artfully On Display With Merry Touches Like Shimmery Ornaments, Pinecones, Berries, Organza Ribbon And Holiday Greens Three Graceful Red Taper Candles Add The Perfect Magical Touch. 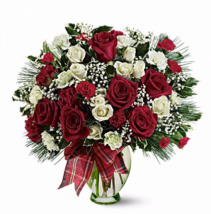 Red And White Roses Are Mixed With Festive Noble Fir, White Pine And Variegated Holly Beneath Two Red Taper Candles, Red Berries And Pinecones Add To The Christmas Fun, Orientation: Allaround. 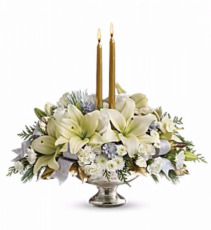 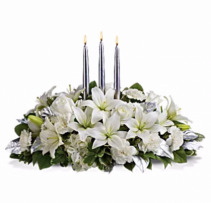 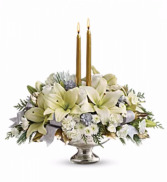 White Flowers, Including Hydrangeas, Asiatic Lilies And Carnations Are Combined With Deep Green Salal, Variegated Pittosporum And Silver Leaves Beneath Three White Taper Candles, Orientation: Allaround. 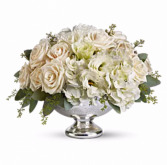 Stunning Crme Roses Along With Elegant White Lisianthus And Hydrangea And Just The Right Amount Of Eucalyptus Are Beautifully Arranged In A Distinctive Silver Bowl A Gorgeous And Eversoelegant Wedding Centerpiece, Perfect For Your Special Reception, Orientation: Allaround. 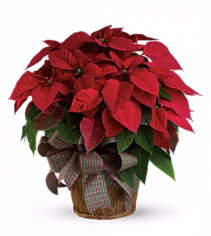 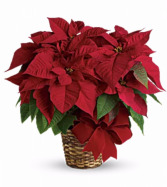 The Classic Christmas Plant Is Potted In A Inch Pot And Presented In A Natural Basket Decorated With Wide Velvet Ribbon, Orientation: Na. The Classic Christmas Plant Is Potted In An Inch Pot And Presented In A Natural Basket Decorated With Plaid Taffeta Ribbon, Orientation: Na. 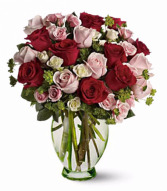 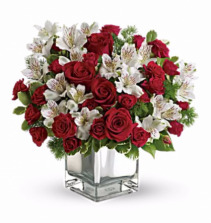 The Delightful Bouquet Includes Red Roses, Red Spray Roses And White Alstroemeria Accented With Pittosporum And Ming Fern, Orientation: Allaround. 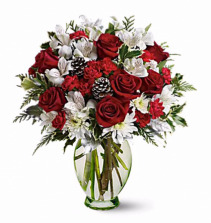 Red Spray Roses, White Asiatic Lilies And Red Carnations Are Accented By Tips Of White Pine, Noble Fir And Holly, Orientation: Onesided. 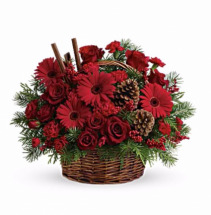 A Handled Basket Of Red Flowers Including Roses, Red Gerbera Daisies And Carnations Is Topped With Festive Cinnamon Sticks, Seasonal Greens Such As Flat Cedar And Douglas Fir Are Mixed In With Pinecones And Berries, Orientation: Onesided. Lush White Roses, Miniature White Carnations And Fresh Flat Cedar Branches Are Gathered In A Stunning Glass Vase And Decorated With Silver Snowflakes, Orientation: Allaround. 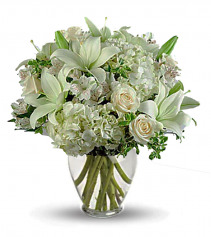 This Snowwhite Bouquet Includes Hydrangea, Asiatic Lilies, Alstroemeria, Miniature Carnations, Stock And Fresh Green Pittosporum. 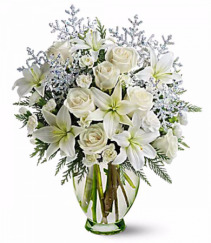 So Much Beauty For Such A Merrily Modest Price Tag, The Lovely Bouquet Includes White Roses, White Spray Roses, White Asiatic Lilies, White Carnations And White Button Spray Chrysanthemums Accented With Assorted Greenery, Orientation: Allaround. Creme And White Roses, White Gladioli, White Miniature Carnations, White Lisianthus And Delicate White Waxflower Are Contrasted With Touches Of Variegated Pittosporum, Orientation: Onesided. Red And White Carnations And Miniature Red And White Carnations Are Accented With Douglas Fir, Seeded Eucalyptus And Lemon Leaf, Orientation: Onesided.